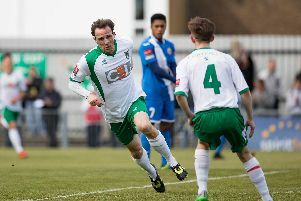 Bognor Regis Town midfielder Tommy Block has been inivited back by Scottish Premiership side Hibernian for a second trial in December. Picture by Tommy McMillan. 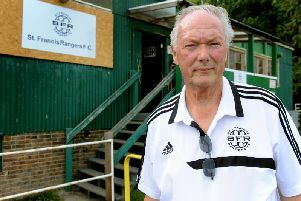 Bognor midfielder Tommy Block has been invited back to train with Scottish Premiership side Hibernian in December, despite suffering with illness during his week in Scotland. Manager Jack Pearce was absolutely delighted that the 18-year-old had been invited back to the Easter Road-outfit but felt the Rocks’ philosophy of ‘buying young, hungry players’ would see a few players leave the club. He said: “It’s a good experience for him and we wish him well. Hopefully he can keep on doing the job for us while he’s with us. Block trained with the first team under the watchful eye of ex-Celtic manager Neil Lennon and then played in a behind-closed-doors friendly game in which he scored with a header from a corner. But he missed two days of training due to illness so Hibernian want more time to run the rule over the youngster.